We have experience working with police departments, regional transit authorities, city buildings, parks, and many other government agencies. Our IP security camera installations are ideal for a wide variety of government needs. Business surveillance cameras with professional installation and support is a necessity to protect and monitor your valuable assets and employees. Do not leave your site unprotected from asset loss from theft or legal liability due to an incident at your facility. Our security camera systems are being utilized nationwide to protect elementary schools, high schools, colleges and universities. Site-wide video surveillance in an invaluable aid to on site physical security. Homeowners looking to upgrade their security camera system from a system found online or in a retail store, look no further! We offer high-end security camera solutions for residential surveillance that can be viewed remotely from any computer or smart phone. Site monitoring for security purposes is what most people think of when they think of surveillance cameras, and is indeed a very common application for our products. 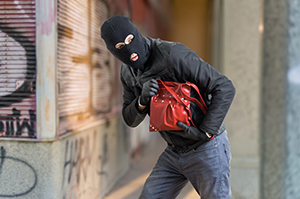 Business security camera installations can act as a deterrent for criminal activity, and video footage can be a valuable aid for criminal investigation. Monitor sensitive areas of your facility as well as high accident areas, like areas surrounding high voltage, automated equipment, cranes, or forklift traffic. Footage can be used to protect your business from any unwarranted OSHA or workers compensation claims, and can be used to identify and correct reckless behavior. Camera footage of the work centers, parking lots, and time clock stations at your operation can be used for process improvement and as a management aid to ensure that operational procedures and standards are being followed, and that workers are accountable for being at work during scheduled hours. 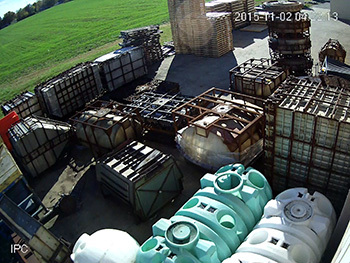 Time lapse footage of events, such as installation of a new machine or reorganization of your plant, can be used as a training aid as well as content for marketing and promotion. Demonstrating your dedication to continuous improvement can inject a lot of enthusiasm within your operation, and bring outside attention to your company's efforts. For installations on large sites or out-buildings, it can often be difficult to get the right cables to where the cameras need to be. Fortunately, our wireless, all-in-one WASP box requires only a power connection to communicate back to the NVR. Our WASP boxes are custom built to your needs, and can feature any type of camera you want. WASP boxes can have up to 8 standard cameras including one PTZ camera, giving you a complete view of any area on site. Have an old analog or coax-based system? No problem. We can replace your existing system with IP-based cameras, or just replace your DVR with an NVR to give you remote access to your system. We have NVR systems that are compatible with coax and IP cameras at the same time, meaning you can save money by using existing cabling and cameras, and also add new IP cameras to your system. Technology has come a long way since you installed that old system, give us a call and find out what an upgrade can do for you! We proudly offer name brand equipment you can trust! GeoVision is one of the best known names in security, offering top of the line cameras and access control products. 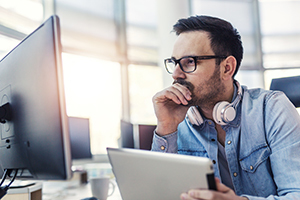 GeoVision software is Windows-based, which is a huge advantage when compared to the competition, bringing the power and flexibility of a PC to the world of security. 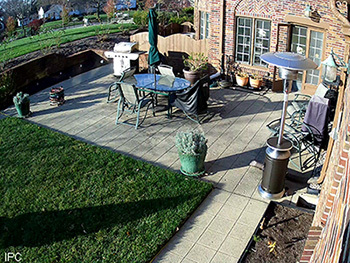 If you're looking for the best security products available, you need a GeoVision system. "We have a small manufacturing business. I understand why some companies would buy a security camera system to prevent employee theft but our employees were not the problem at all. We simply had a problem with thieves stealing our raw materials, mostly the copper that we store in a fenced area on the back side of our business. After we mounted four, what I would call full size cameras, on the back side of the building we have not had another problem. Our fingers are crossed that we don't have any more problems. But if we do, at least we will have something to turn over to the police." "My wife and I run a small Dental Laboratory in Dayton, Ohio. We have very few if any walk-in visitors, but we do have a small waiting room. Since we seldom have anyone sitting at the window we decided to install a four-camera security system and, of course, put one camera watching the front door and our small waiting area. Now, whenever someone is in the room I can see them from my desk in the back as I simply launch a web browser that logs into my camera system for a live view. We also went ahead and put a camera on the back door and two more to watch the benches where my technicians work." "We live in a nice neighborhood, but over the years the adjoining neighborhoods have really started to decline. After our second break-in in two months, we knew we had to do something. It's been over a year now and we've not had another problem. Perhaps it's because we put so many cameras up along with the yard signs that say "Camera Security Now", which you can't help but notice. But whatever the reason, we now have total coverage of our yard and doors. It's a great feeling knowing that if anything happens we'll least be able to see it on video and have something to turn over to the police." 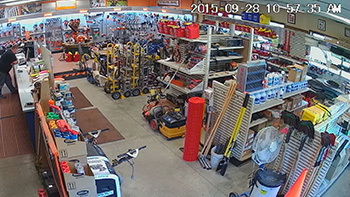 "We wanted a security camera that monitored our point of sale area for our repair shop. We weren't concerned with employees stealing as much as we were concerned with them not properly charging for our services. The security cameras helped us nip these transactional problems in the bud and have helped us better train our employees on the correct procedures." "We have several employees who leave the office after dark and we wanted to have some security cameras around the parking lot for their safety. 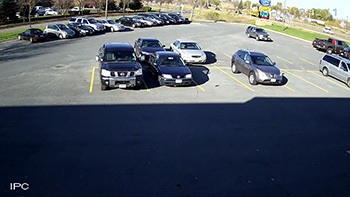 Besides being used as a deterrent, the cameras came in handy when one of our employees cars was hit in the parking lot. 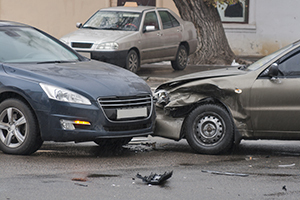 They were able to use the surveillance footage off our system to file their insurance claim." "My family owns a small tool rental shop and on more than one occassion our equipment has not been returned. 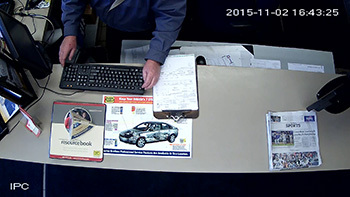 After getting our system installed by Camera Security Now, everyone who comes in the store can see we have amazingly clear video of them, their transaction, and even the car they were driving. This one small investment has made a world of difference in our equipment loss rate."